Running as a sport can be traced back to the ancient Greeks, who advocated a culture based on sound bodies and sound minds. During Greek athletic contests, runners competed barefoot and often naked. Later, the Romans mandated that their messengers wear thin-soled sandals. As shoemaking evolved through the centuries, leather became and remained the favored material because of its durability. However, the first references to shoes designed specifically for running don't appear until 1852, when historians noted a race in which runners wore shoes with spiked soles. In 1900, the first sneaker, or all-purpose athletic shoe, was designed. Made primarily of canvas, this sneaker featured a rubber rim made possible by Charles Goodyear's 1839 discovery of vulcanized rubber. Known about for 1,000 years, rubber was finally rendered commercially useful when Goodyear heated and combined it with sulphur, thereby preventing it from hardening and losing its elasticity. In athletic shoes, rubber helped to cushion the impact of running on hard surfaces. However, it did not last as a shoemaking material: it was not durable, and leather returned as the preferred material for running shoes. Yet leather wasn't the ideal fabric, either. In addition to being expensive, leather shoes caused chating, and runners had to purchase chamois liners to protect their feet. A Scotsman known as "Old Man" Richings provided some relief when he invented a customized shoe designed with a seamless toe box (a piece of material inserted between the toe cap and the shoe lining and treated with a hardening agent, the toe box protects the toes against rubbing). In 1925, Adolph Dassler, a German shoemaker, decided to concentrate on athletic shoes, and founded a business with his brother, Rudolph, to do so. The Dasslers' running shoes provided both arch support and speed lacing, and their high-quality products attracted prominent athletes including some Olympians: Jesse Owens is reported to have worn Dassler shoes during the 1936 games in Munich. The brothers later formed separate companies—Adolph, the Adidas company and Rudolph, the Puma company. Another manufacturer of running shoes during the mid-twentieth century was Hyde Athletic of New England, although the company specialized in football shoes. 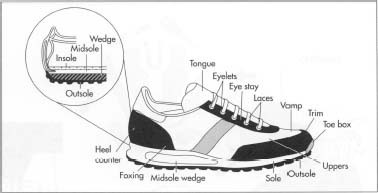 A 1949 description of Hyde's running shoe said that it featured kangaroo leather, a welt construction (a welt is a strip used to connect the upper to the sole—see "Design" section below), an elastic gore closure (a triangular piece of leather on the upper part of the shoe), and a leather sole covered in crepe rubber, a crinkly form of the material used especially for shoe soles. One of the most unusual running shoes of the mid-twentieth century was worn by the Japanese runner who won the 1951 Boston Marathon. Called the Tiger, his shoe was modeled after a traditional Japanese shoe that enclosed the big toe separately from the other toes. During the 1960s, a company called New Balance began to examine how running impacts the foot. As a result of this research, New Balance developed an orthopedic running shoe with a rippled sole and wedge heel to absorb shock. As running became more popular and joggers more knowledgeable, the demand for footwear that would help prevent injuries increased. Many runners also began to request shoes that provided support in a lightweight construction, and nylon, invented during World War II, consequently began to replace the heavier leather and canvas materials previously used to make running shoes. Today, however, the comfort of the running shoe isn't known only to the jogger. Running shoes can be spotted on just about anyone who wants comfort in a shoe. In fact, running shoes have ceased to surprise when they appear on the feet of otherwise formally-attired office workers en route to work. In 1990, consumers spent $645 million for 15 million pairs of running shoes, and experts note that the majority bought were used for comfort rather than running. 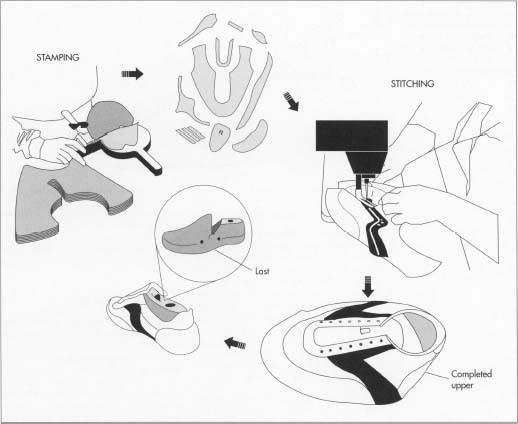 The first step in running shoe manufacture involves die cutting the shoe parts in cookie cutter fashion. Next, the pieces that will form the upper part of the shoe are stitched or cemented together. At this point, the upper looks not like a shoe but like a round hat; the extra material is called the lasting margin. After the upper is heated and fitted around a plastic mold called a last, the insole, midsole, and outsole are cemented to the upper. traction and absorbs shock. The midsole is designed specifically for shock absorption, and the wedge supports the heel. Located inside the shoe, the insole also contains the arch support (sometimes called the arch cookie). 2 Next, die machines stamp the shoe shapes, which are then cut out in cookie cutter fashion with various markings to guide the rest of the assembly. After being bundled and labeled, these pieces are sent to another part of the factory where they'll be stitched. Completed running shoes are quality tested using procedures developed by the Shoe and Allied Trades Research Association. Defects that are checked for include poor lasting, incomplete cement bonding, and stitching errors. 3 The pieces that will form the upper part of the shoe are stitched or cemented together and the lace holes punched out. These pieces include the featherline, the vamp, the mudguard, the throat (with eyestay and lacing section), the tongue, reinforcements such as the saddle or arch bandage, the collar (with Achilles tendon protector), the foxing, and the logo. At this point, the upper looks not like a shoe but like a round hat, because there is extra material—called the lasting margin —that will be folded underneath the shoe when it gets cemented to the sole. Manufacturers can test their materials using procedures developed by the Shoe and Allied Trades Research Association (SATRA), which provides devices designed to test each element of the shoe. Once the shoe is complete, an inspector at the factory checks for defects such as poor lasting, incomplete cement bonding, and stitching errors. Because running can cause a number of injuries to the foot as well as to tendons and ligaments in the leg, another test is currently being developed to evaluate a shoe's shock absorption properties. In the near future, experts predict refinements of current designs and manufacturing processes rather than radical breakthroughs. Within the next ten years, athletic shoe sizing should become standard worldwide. Designers will continue to seek lighter weight materials that provide better support and stability with further use of gels and air systems. Electronic components will also be built into the running shoe, so that information about physical characteristics and developments can be measured with a micro chip and later downloaded into a computer. Another feature that is already beginning to appear is the battery-operated lighting systems to accommodate the evening jogger. As consumers continue to spend millions for the comfort of running shoes, manufacturers of the ordinary shoe will continue to compete for these dollars by applying running shoe design principles to everyday shoes. The Shoe in Sport. Mosby-Year Book, 1989. Begley, Sharon. "The Science in Sports." Newsweek. July 27, 1992, p. 58. "Running Shoes: The Sneaker Grows Up." Consumer Reports. May, 1992, pp. 308-314. Ireland, Donald R. "The Shocking Truth about Athletic Footwear." ASTM Standardization News. June, 1992, pp. 42-45. Murray, Charles J. "Composite Insole Absorbs Shock in Running Shoes." Design News. May 2, 1988, p. 100. Wolkomir, Richard. "The Race to Make a 'Perfect' Shoe Starts in the Laboratory." Smithsonian. September, 1989, p. 94. Thanks for the info, very informative. Keep up the good work. I would to know more about the raw materials of soles, Especially polyurethane and carbon rubber.